It’s hard to be a car guy or gal and not know who Ken Block is. Block is a race driver and car guy that makes some of the coolest videos out there, with big production values and awesome vehicles. The latest of the Gymkhana videos from Block was Gymkhana 10, and in the video, there is a handful of slick cars, but the coolest of them all is the 1977 Ford F-150 Block dubbed the Hoonitruck. This beast has the heart of a Ford GT packed inside the body of an old truck with an AWD system and 914 horsepower meant solely for going sideways and destroying tires. To make the Hoonitruck come to life required some help from Ford Racing. One of the parts you might not have taken that much notice of is the intake manifold that sticks out of the hood of the truck between those massive turbos. Ford has announced that particular part is the largest 3D metal-printed part for a working vehicle in automotive history. Ford Performance engineers in the U.S. ran performance simulations and worked with a team of engineers based in Europe for the structural analysis work required to design the slick looking part. A part that feeds air into the cylinders can’t just fall apart under the stress of the heat and vibration made by the hundredth donut of the day. 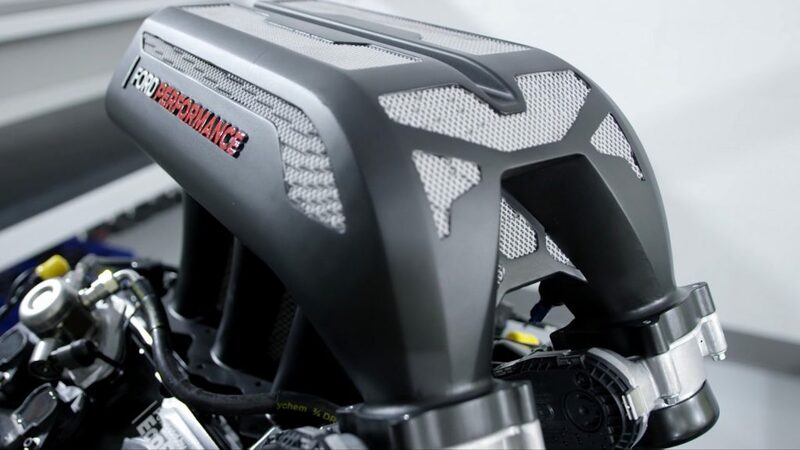 If the part did crumble, it could drop debris directly into the engine’s cylinders making that 914 horsepower EcoBoost V6 go to performance heaven in short order. Once the engineers finished the design, the RWTH Aachen’s Digital Additive Production Institute in Germany constructed the aluminum intake manifold. The resulting 3D printed manifold weighs almost 6 kilograms; the entire build process took five days to complete. Block says that the fancy intake manifold is his favorite part of the beast and that it couldn’t have been built any other way. If you are wondering what led Block to create such an insane truck, he created a cool video that explains his inspiration. If you missed the Gymkhana 10 video and want to see the tire shredding action, it’s most definitely worth a watch. An in-depth look at the Hoonitruck might be just what you need to make your day better.